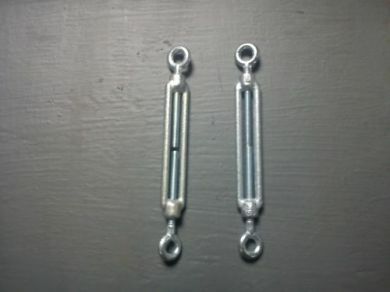 Two turnbuckle adjusters for a variety of applications, but ideal for the correct adjustment of fenders. Each turnbuckle is 160mm closed, and 250mm fully extended. The rings at the end are 10mm internal and 20mm external diameter. They are easy to adjust by rotating the body of the adjuster.